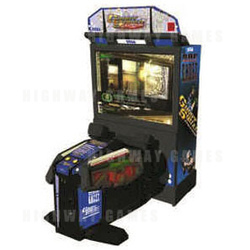 Ghost Squad Evolution DX Arcade Machine is an expansion of the original Ghost Squad shooting game, where players take the roles of elite special forces agents called the "Ghost Squad". Also known as Ghost Squad 2, Ghost Squad Evolution DX features a heap of new missions, disguises and weapons. The game play and extras have increased significantly for this expansion incluing; 12 more levels (now totaling 16), increased missions difficulty, 10 new disguises (now totaling 14), new costumes ranging from the dangerous to the hilarious Panda suit AND 21 new weapons (now totaling 25) that range from standard issue to a one man army. The 2 player cabinet features a 55 Inch LCD screen and rifles which can be set from single shot to 3 burst shot to automatic fire. The rifle features special effects to suit any situation such as a a Flash Light for night time and a scope for sniper usage. The gun also features an action button which is used to pull off special moves like hand-to-hand combat and has recoil effects on every shot fired. This sega gamed was billed as the most exciting, innovative and revolutionary gun game of the century and is sure to draw customers to you location!